2016 celeb: Dennis Cestra, Jr.
Like many Hampton Roads residents is a transplant from out of state, having moved to the area from Pittsburgh, PA. Dennis’ grandparents Anne & Howard Hanna founded Howard Hanna Real Estate Services in a one room office in 1957. Since its humble inception, Howard Hanna has grown to become the 4th largest real estate company in the country, while still being 100% family owned and operated. 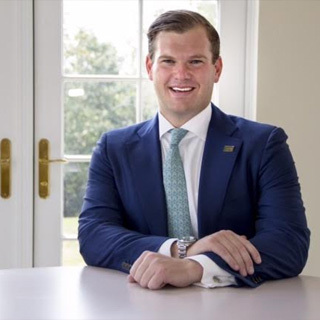 Dennis moved to the Hampton Roads area to help lead Howard Hanna William E Wood and grow the business into the largest real estate company in Virginia. Dennis has worked in every major line of business within the Howard Hanna family of companies, spending the most time selling homes in Pittsburgh, PA, where he became a top producer in Howard Hanna’s Fox Chapel office. His diverse business practices gives Dennis a unique view of the entire home buying experience. Dennis’ grandmother Anne Hanna instilled a strong sense of civic duty into the entire Hanna Family. Dennis currently sits on the board of Bethlehem Haven, William E. Wood Charitable Foundation, and the Future Generations Board for Children’s Hospital of the King’s Daughters. Dennis is also a strong supporter of Cystic Fibrosis Foundation, having been voted one of Pittsburgh’s 50 Finest for his work with the organization in 2015. Dennis earned his Bachelor’s Degree from Allegheny College, in Meadville, PA, and his Master’s Degree in Real Estate Finance from Georgetown University. He holds his real estate license in both Virginia and Pennsylvania.